Classical quartz vein or lode emplaced in a fracture in tonalite (granitic) host rock. This quartz vein contains patches (shoots) of gold that are surrounded by milky quartz gangue. 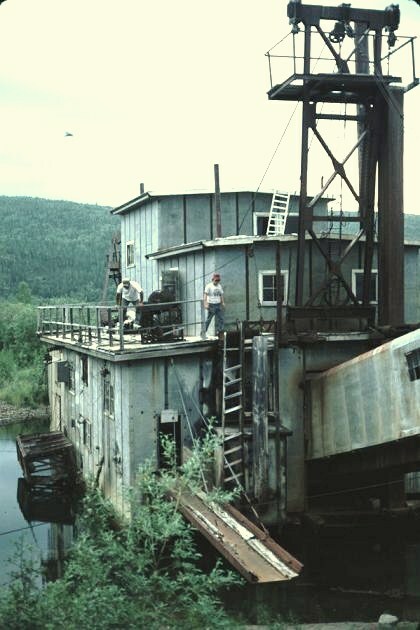 Photo taken in the lower level of the Mary Ellen Mine at South Pass. Note that the vein has been faulted and offset. According to one the glossary of geology, “a lode is a mineral deposit consisting of a zone of veins, veinlets, disseminations, or planar breccias; a mineral deposit in consolidated rock”. This is straight forward to most geologists, but in may not be for many prospectors. Most prospectors think of lodes as veins. This is partially correct, but a vein is only one type of lode. 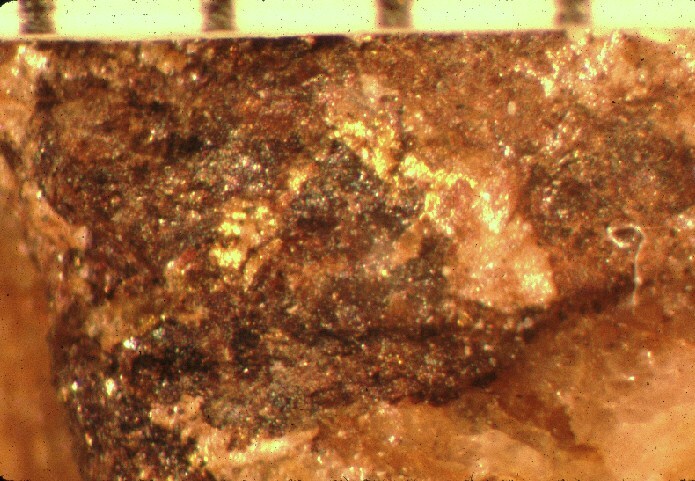 Visible gold in limonite and hematite from a shoot at the Mary Ellen mine. “(1). 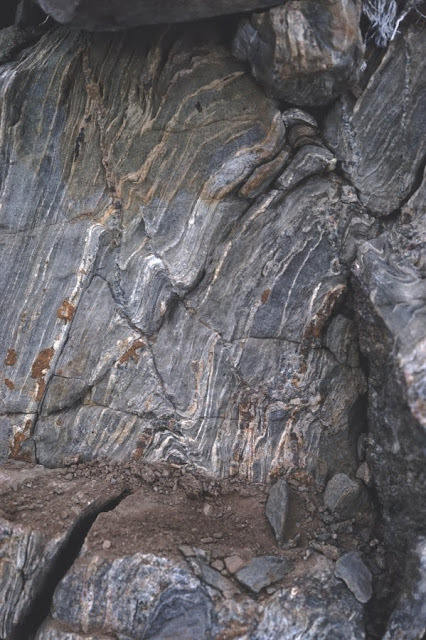 An epigenetic mineral filling of a fault or fracture in a host rock, in tabular or sheet-like form, often with associated replacement of the host rock; a mineral deposit of this form and origin. (2). A zone or belt of mineralized rock lying within boundaries clearly separating it from neighboring rock. It includes all deposits of mineral matter found through a mineralized zone or belt coming from the same source, and appearing to have been created by the same processes. the vein projects into the earth). This is a very distinctive vein. (3). A rock fissure filled by intruded mineral matter. Many valuable minerals are co-deposited with gangue in veins. Usually the formation is steep to vertical, unlike a bedded deposit in which values are sandwiched horizontally. Vein is typically long, deep, and relatively narrow. (4). The term lode is commonly used synonymously for vein”. Most prospectors visualize a lode to be a distinct vein of quartz. But lodes include more than just veins. But let’s briefly look at veins first. Veins can be formed primarily of quartz, but another common gangue mineral is calcite. Gangue minerals are worthless material that is found with valuable minerals, and when combined, the two produce ore. 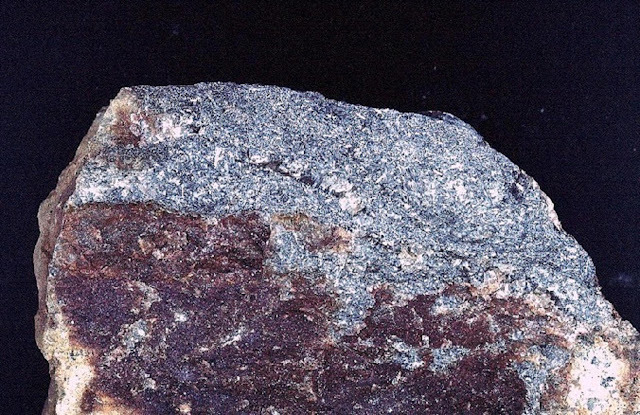 So ore is just a mixture of the good and bad stuff. The formation of ore shoot in veins is not entirely understood, but they appear in many cases to be the result of changes in chemistry sometimes due to changes in the rock type in the wall rocks. They have been identified where veins are folded or where veins intersect other veins or fractures. width of the gold lode as well as the volume of ore.
Often prospectors and geologists get so focused on the vein, they miss all of the other good stuff nearby. At the Vulture mine, adjacent to the vein is a very attractive looking gossan. Apparently, only a minor amount of this gossan was mined by open pit - it may have been because it was low grade, but at any rate, it should be sampled in detail. In Arizona, there are numerous deposits of detrital gold found in fanglomerates that contain enough gold for placer miners. This may also be true at the Vulture mine where a distinct fanglomerate was dug into in the past. At the Vulture mine, the gold-quartz vein has a prominent gossan adjacent to the vein and this gossan also has a fanglomerate (a conglomerate deposited as an alluvial fan and derived from a nearby gold deposit). This fanglomerate appears to have had some values because the miners drifted into the eluvium. At the Commonwealth mine in the Pearce Hills of the southern Dragoon Mountains of Arizona, in some places the lode is very district forming a prominent veins. 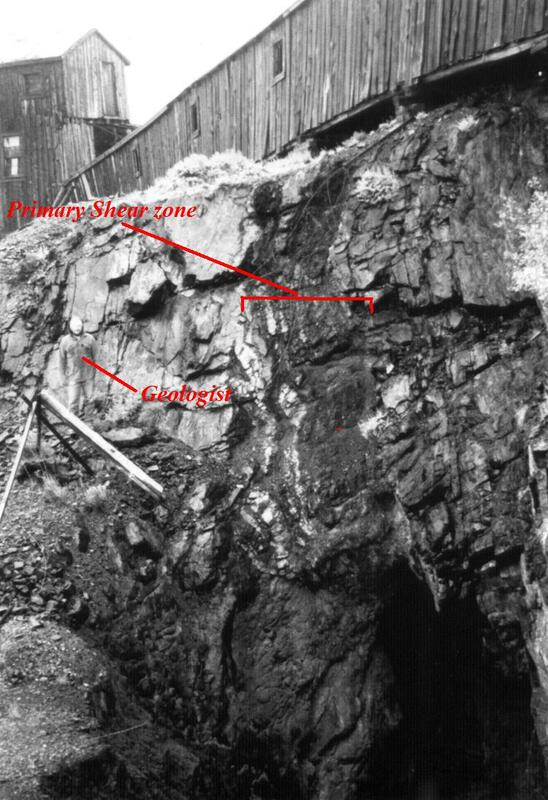 But other veins in this area are referred to as stockworks and may not be so well-defined to prospectors even though most geologists would get very excited over these stockworks simply because the stockworks (veinlets) are often mineralized as are the rocks fragments in between. So these deposits often represent large tonnage deposits of low grade ore.
quartz vein containing silver and gold. 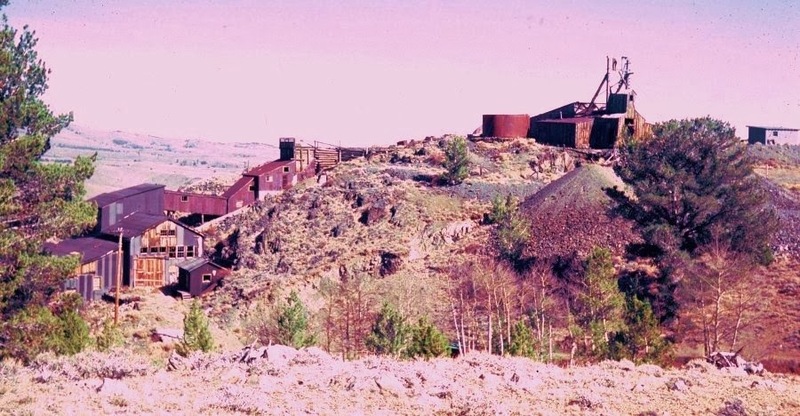 Stockworks in the Pearce Hills of Arizona. Many narrow silver-gold veinlets with breccia fragments inbetween that are also mineralized in silver and gold. Stockworks at the Copper King mine in Wyoming. This deposit may not look like much, but it has a 2 million ounce gold equivalent ore deposit that has excited me since I first looked at it back in 1981. The ore deposit is open in several directions and potentially could be even larger. Most quartz vein gold deposits in Wyoming are mesothermal, meaning that they were formed at great depth. These are usually boring veins that show little textural or color difference and are difficult to predict if they contain commercial mineralization or just 'bull' quartz. One of the principal guides for gold in these types of veins are tawny to light yellow-green limonite associated with the veins. 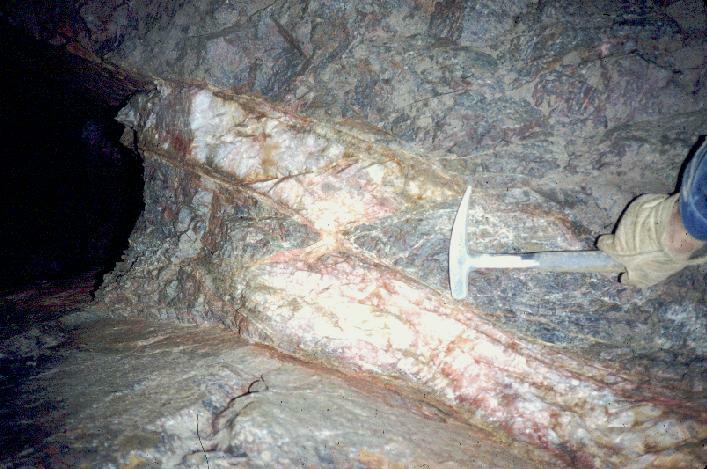 Upper Gold Road vein (lode) in Arizona with open vugs and banded quartz. King mine, Mother Lode, California. and banded quartz typical of an epithermal vein. In other areas, like Arizona, San Juans of Colorado and Nevada, many veins are epithermal (high-temperature veins formed near the surface) and may have all kinds of textural features including some opaline quartz, banding, and open vugs. One of my favorite lodes is that of the Carissa mine in the South Pass greenstone belt of Wyoming. This lode is incredible. Everytime I led a field trip to this mine (possibly a dozen times or more), at least one person (or several) found samples of quartz with visible gold. Drilling established that the deposit was commercial grade and actually very high grade for a vein deposit. It averaged between 0.15 to 0.3 opt Au! Being curious, while mapping this greenstone belt, I checked the wall rock at the Carissa lode and discovered that the wall rock was actually part of the lode! I found gold in the wall rock over a few hundred feet and found evidence that the shear zone (lode) was as much as 1,000 feet wide!!! Drilling by past companies also established that the gold mineralization continued to depths of just under 1,000 feet (no one had drilled any deeper). Based on the geology and ore deposit type, I would expect this lode to continue to much greater depth- 2,000, 3,000, 5,000 or more feet! So here is was, the mother lode sitting in Wyoming. The gold deposit likely contains a few million (or more) ounces. So, state government again proved they were filled with geniuses and purchased the mine, withdrew it from mining, and opened up a tourist attraction that brings as many as 200 to 300 people a year to the South Pass City historical site at no cost. No visible quartz but lots of tawny limonite - is this a lode? Could be. One would need to take samples in the limonite initially, to see if it has any gold. suits only their special interests and not the interests of the people they represent. Gold in the San Juan Mountains of Colorado. As a gold prospector you should immediately notice the mine dumps, lack of trees growing on the yellow, brown, reddish brown and tawny colored rock and soil known as gossan. It's obvious that these gossans were mined in the past, but look at all of the exposed gossan in the high peaks that have not been mined. It is likely there are several rich gold and silver deposits still to be found in this area. Just search Google Earth for 'Red Mountain No. 1, Colorado', or 'Silverton, Colorado' to find this and other gossans scattered over a very large region near the 'Million Dollar Highway (550) in southwestern Colorado. 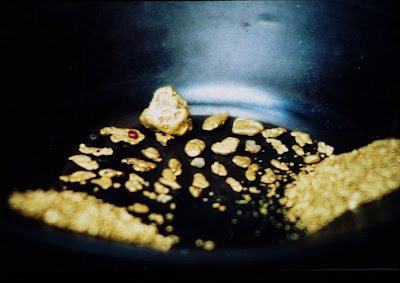 Gold Prospectors like to generalize gold deposits into two groups - lode gold (gold which is found in place in outcrop) and placer gold (detrital gold eroded from a nearby lode and deposited in a stream). Both deposits are important, but for the gold prospector, placer gold deposits are most important because many can be worked with smaller resources and less cost that most lode gold deposits. But still, you need to consider scientific prospecting methods to insure that you have a commercial gold deposit and that you do not make mistakes like many of us have seen on the TV program Gold Rush. This morning, I'm going to talk a little about gossans - something every gold prospector needs to know about as these are often guides to lode gold, and they are constantly overlooked by gold prospectors. They are also guides to placer gold simply because if they are gold bearing, erosion will tend to release the gold over time and transport the precious metal down slope to a nearby stream. As an example, while watching Gold Rush, I keep seeing a distinct gossan each week located at one of the featured deposits, and it is never mentioned on the program by anyone, nor is it ever explored. So after you learn about gossans, start looking for these on Gold Rush, but also look for gossans on sites like Google Earth. cubic pits where other crystals of 'fool's gold' fell out of the rock. And how important are gossans? Over the years, I identified several hundred gold anomalies and several gold deposits, most are associated with some kind of gossan. I've been so successful with this that I have found nearly $100 billion in gold contained in gold deposits! For example, check out the following sites at the University of Wyoming, the Casper Journal, Planet News, and the Gemstone State. After reading these, you probably have a picture of me in a jacked-up, 4-wheel drive Ferrari with oversized mud tires prospecting for gold in the outback. Well, I've been blessed with excellent prospecting intuition, but when it comes to retaining treasure - I must have been absent when they passed out that part of the brains. So yes, I've made many people very rich, but I'm not one of them. No problem: if I had to do it over again, I would have done it all pretty much the same. I do wish I had some of that money to pass it on to my kids and grandkids, but I love to prospect and material possessions are not that important to me. habit. This specimen has relatively high heft. Oops, I forgot: I was talking about gossans. Most of us are familiar with pyrite (FeS2), an iron-sulfide mineral that we often hear discribed as 'fool's gold'. It should be called 'doublely fool's gold' because you can be fooled by it two different ways. First, it's not gold, although it kind of looks like gold to the uninitiated. characteristically rounded and much heavier than pyrite. In my mineralogy book, I described pyrite as having relatively high heft. This means it has a relatively high specific gravity (5.0) such that if you had one, big, massive piece of pyrite with no rock matrix, it would feel heavy. If you hefted it up into the air and caught it in your hand, the specific gravity would be noticably high. Pyrite has a specific gravity of 5.0, meaning it is 5 times as heavy as an equivalent volume of water. I also point out that pyrite is brassy colored, not gold colored. other things of note mentioned in my book is that pyrite is brittle, whereas gold is maleable. This means if you apply pressure to pyrite, it will crush to a fine greenish-black powder, but gold will just deform. So, don't make the mistake of thinking pyrite is gold - it can be costly in some cases. But as a gold prospector, you need to also realize that pyrite can fool you again - particularly if you throw it away without assaying it. In my 2011 gold book co-authored my son, we describe some pyrite around the world that has considerable hidden gold! That's right, as much as 2000 ppm (parts per million) gold has been noted hidden inside the pyrite crystals. That means as much as 60 ounces of gold per tonne might be hidden right under your nose and you may never see it if you don't have it assayed, crush the pyrite to a very fine powder and pan it for gold, examine many specimens under a microscope, or look closely at the gossan produced by the pyrite for visible gold. But one more way it can actually fool you is that you may have a good gold deposit in what is known as noseeum gold (invisible gold). Well, the gold is not really invisible except to our eyes. It is in stealth mode with individual gold atoms replacing some of the iron atoms in the pyrite atomic structure. So how do you know its there and how do you get it? In this case, it has to be assayed. Then to recover it requires some serious chemistry mentioned in our gold book. If you have a lot of invisible gold, it might be in your best interest to try to sell it to a mining company as it is not going to be cheap to mine and recover. United Verde mine, Jerome, Arizona. Note the well-defined gossan exposed in the highwall. This mine was so rich in pyrite, that the pyrite actually caught on fire deep underground and burned for many years. Back to gossan. Pyrite is just iron sulfide. When it weathers, it produces a chemical reaction that releases heat yielding sulfuric acid (H2SO4), rotten egg gas (Fe2S) and rust (Fe203, Fe0H). If you have ever been close to any politician, you have a good idea of what hydrogen-sulfide (rotten egg gas) smells like. If pyrite is massive enough and suddenly comes in contact with oxygen, it can actually catch on fire because of heat released by the chemical reaction to produce rust. This actually happened at the United Verde mine in Arizona, where miners interesected massive sulfides (pyrite) at depth exposing the sulfides to oxygen: the fire burned underground for many years until it extinguished itself. Sample of massive pyrite collected from the Tin Cup district. Note that the brassy, metallic pyrite appears to be partially replaced by brownish mud. The brown material is actually limonite, goethite and hematite (rust) or the classical gossan! So, pyrite tends to rust and is replaced slowly by limonite, hematite and goethite (iron oxides). So by now, you should start getting an idea of what a gossan is. It is rust produced from sulfide minerals that sometimes contain gold and silver. So this is why we look for gossans. while exposiing the gold hidden inside the pyrite. Now if the pyrite has gold, the gold is most often immobile (which means it remains right were it originated while the pyrite (chalcopyrite, chalcocite, etc) turns to rust. Often, this results in visible gold showing up in the gossan. A few months ago, someone contacted me and sent an excellent photo of a piece of limonite with quartz and lots of visible gold. This photo is perfect to illustrate what I'm writing about, but I need to dig through my email and get this person's permission and name to give them credit. Hopefully, I can find that email - if not, please send me your gold photos (with limonite), name and permission to use. Until I get permission from that person, the photo above also works quite well. This is a specimen found in the Mary Ellen mine by Steve Gyorvary who donated it to the Wyoming Geological Survey (before it became a den of scum from 2004-2008) and I photographed it using a binocular microscope (the scale is not really in meters as I like to tell some people, it is a millimeter scale). Chalcopyrite (also known as copper pyrite) also will rust to produce gossan with some copper minerals such as tenorite, cuprite, malachite, etc. So, if you have a lot of pyrite and it rusts, you now have a gossan and an excellent visible guide to gold, silver and other valuable materials. Sometimes pyrite will oxidize and leave silica rich ridges that look porus that are known as boxworks. When you find boxworks, always look close at the ridges to see if there is any visible gold. Idaho, Oregon, Washington and Wyoming often have visible gold. In 1981, I started one of several gold rushes in Wyoming after finding specimens of gossan and boxworks with visible gold. The samples assayed as high as 2.87 ounces per ton of gold! These were found on the Penn mine dumps in the Seminoe Mountains greenstone belt. Pyrite and chalcopyrite not only produce gossans, but other valuable minerals also produce gossans. Often the gossans will have slighting different colors due to trace metals. Beautiful fluorite producing a distinct yellow limonite. 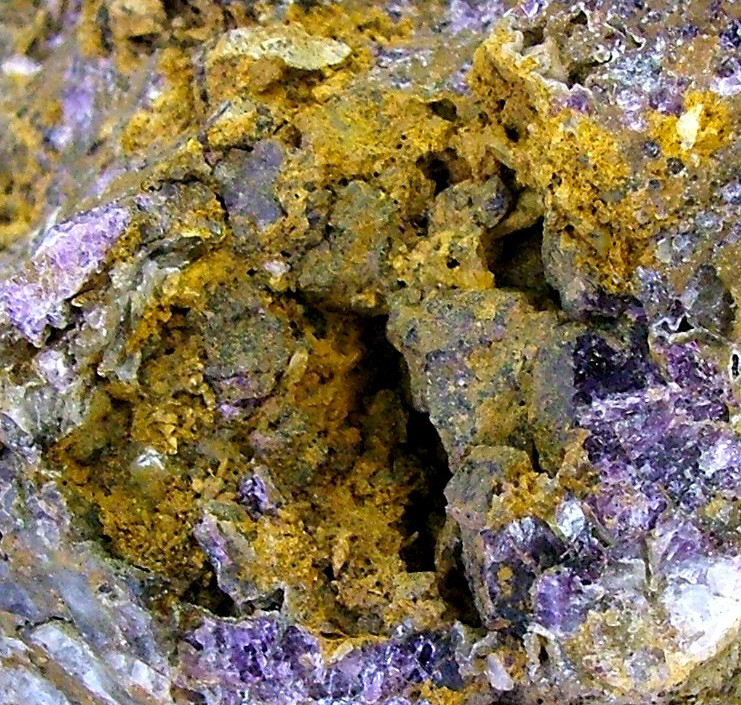 Fluroite is sometimes found with gold. This specimen from the Bear Lodge Mountains district where some gold and rare earth deposits are found. Arsenopyrite with blood reddish brown limonite gossan. Arsenopyrite smells like garlic (its the arsenic) and sometimes yields a greenish-yellow limonite. Often arsenopyrite also contains hidden gold as we discovered in Alaska. Iolite (water sapphire) altering to limonite. This very high-quality gemstone is part of a world-class iolite gemstone deposit that I discovered in the central Laramie Mountains.